Mao was the 20th century's answer to Napoleon: a brilliant tactician, a political and economic theorist, and a statesman who ruled a billion people for three decades. Mao founded the People's Republic of China and was one of the most prominent Communist theoreticians. Mao's ideas on revolutionary struggle and guerrilla warfare were extremely influential, especially among Third World revolutionaries. Mao was one of the original members of the Chinese Communist party, he organised peasant and industrial unions (the Kuomintang's Peasant Movement). After the Kuomintang-Communist split in 1927, Mao led the disastrous Autumn Harvest Uprising in Hunan, leading to his ouster from the central committee of the party. From 1928 until 1931 Mao established rural soviets in the hinterlands, and built the Red Army. In 1931 he was elected chairman of the newly established Soviet Republic of China.The civil war between the Communists and the Kuomintang continued during and after the war with Japan. In 1949, after the Communists had taken almost all of mainland China, Mao became chairman of the central government council of the newly established People's Republic of China. The failure of this program resulted in 20 million people starving to death and a break with the Soviet Union, which cut off aid. Mao accused Soviet leaders of betraying Marxism. In 1959 replaced Mao as chairman of the central government council, but Mao retained his chairmanship of the Communist party politburo. The (1966-76) was led by Mao and his wife and directed against the party leadership who were removed from power in 1968. In 1969 Mao re-asserted his party leadership by serving as chairman of the Ninth Communist Party Congress, and in 1970 he was named supreme commander of the nation and army. The Cultural Revolution group continued its campaigns until Mao's death in September 1976. A month later its leaders were purged and Mao's surviving opponents slowly regained power. 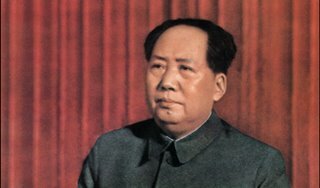 In death Mao has become divine, worshiped as a god in a godless country. Considering who and what he ruled, Mao, with his Little Red Book, might just be the single most powerful human being who ever lived.